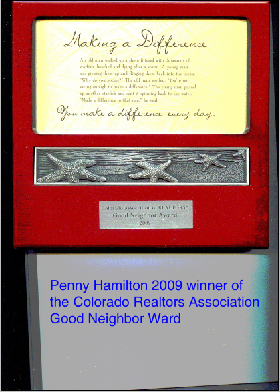 After nearly a decade of agent/broker real estate experience, Penny Hamilton, Ph.D., left a major national real estate company in 2000 to create Forest & Lake Real Estate. The mission of Forest & Lake Real Estate is to provide personal real estate services considerably over and above accepted industry standards to a few select clients. At Forest & Lake, clients are accepted by referral or appointment only. This boutique company caters exclusively to discerning and sophisticated buyers and sellers who place a high value on highly-personalized service, privacy, discretion and constant communications. At Forest & Lake, quality, not quantity, is the central focus. For that reason, Forest and Lake Real Estate limits the number of properties and clients it will represent at any one time. We are here to help you every season, every day. Just call 970-887-2101 Forest and Lake Real Estate.